GrowSpan’s growing structures don’t just pertain to greenhouses. For decades, GrowSpan has been supplying growers with high-quality high tunnels and low tunnels that protect crops and boost business. With the help of a GrowSpan low or high tunnel, growers are able to start growing earlier and get to market first, while also getting an extra harvest at the end of the season, allowing them to make more money each year. While these structures lengthen the growing season, they also provide crops with cost-effective protection. 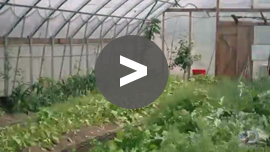 They create a covered environment that wards off potentially damaging weather, like hail or snow, and can also help to keep pests away from valuable crops. Although GrowSpan’s tunnels provide an enclosed space, ventilation never has to be an issue. Customers have the choice of integrating Roll-Up or Drop-Down Sides. Either option can be easily operated, and structures can be ventilated or enclosed in a matter of moments with Growers Supply’s “Twist-of-the-Wrist” Assembly. GrowSpan tunnels meet NRCS requirements, so growers may qualify for government funding. Natural ventilation – Choose between roll-up and drop-down sides. While tunnels can quickly breakdown and become an eye sore, GrowSpan tunnels maintain the integrity that GrowSpan greenhouses are known for. GrowSpan tunnels are built to last and feature durable frames and cover options. This limits the amount of required seasonal maintenance, while also promoting the aesthetic value and beauty of any growing operation or property. GrowSpan tunnels are a great way to quickly improve any growing operation, and with Growers Supply getting a high tunnel has never been easier. Call or Request a Quote today to find out how a GrowSpan High Tunnel can meet your needs.